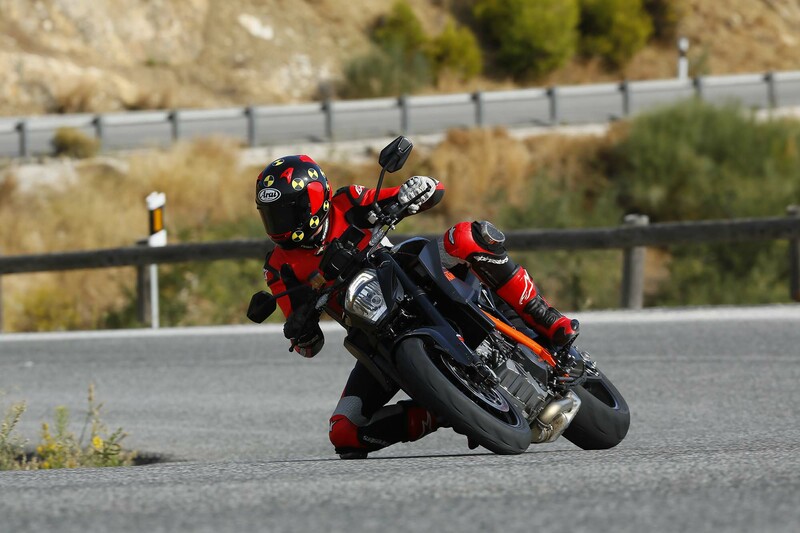 Attending KTM’s launch of the 2014 KTM 1290 Super Duke R in Spain, or friend Iwan van der Valk from Testmotor.nl has been kind enough to share his thoughts and review regarding Austria’s newest hooligan machine. 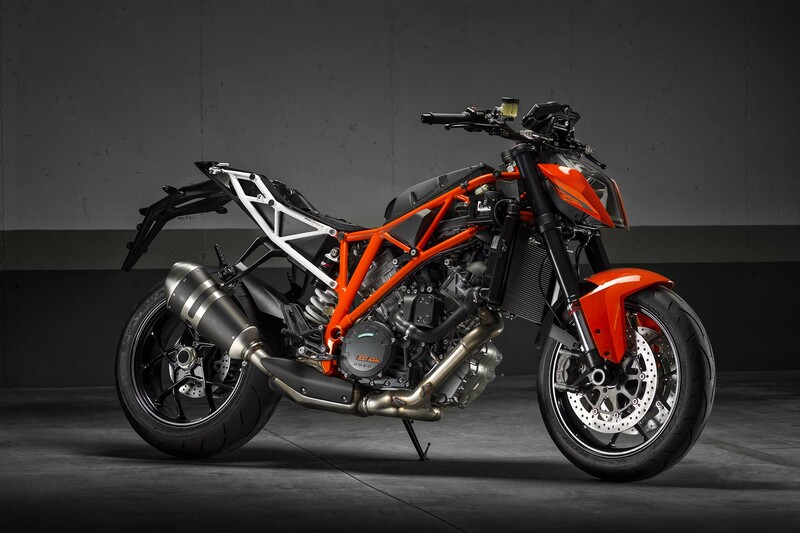 For 2014, KTM is launching the third model of the Super Duke line, which they have been selling since 2005 (note: KTM mentions it’s the fourth edition because of the small upgrade in 2011). 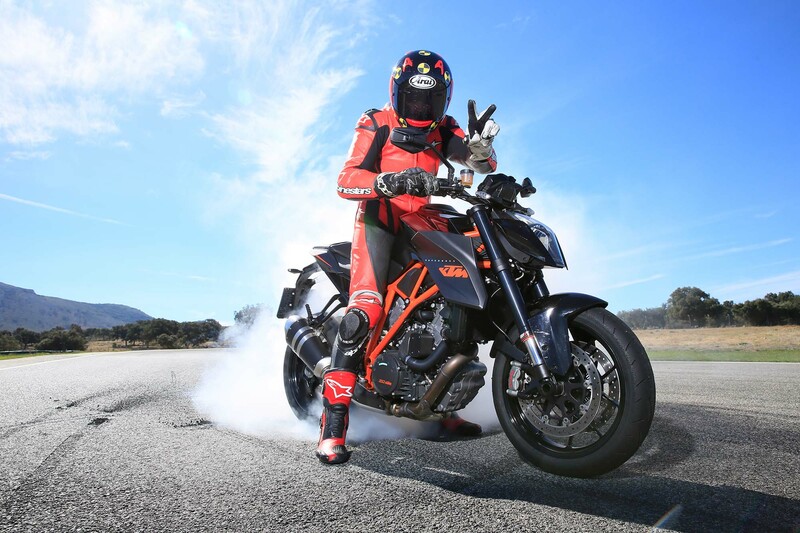 The new KTM 1290 Super Duke R has a brand new 1,301 cc v-twin engine, that delivers a huge amount of horsepower (180bhp) and a mountain of torque (106 lbs•ft). 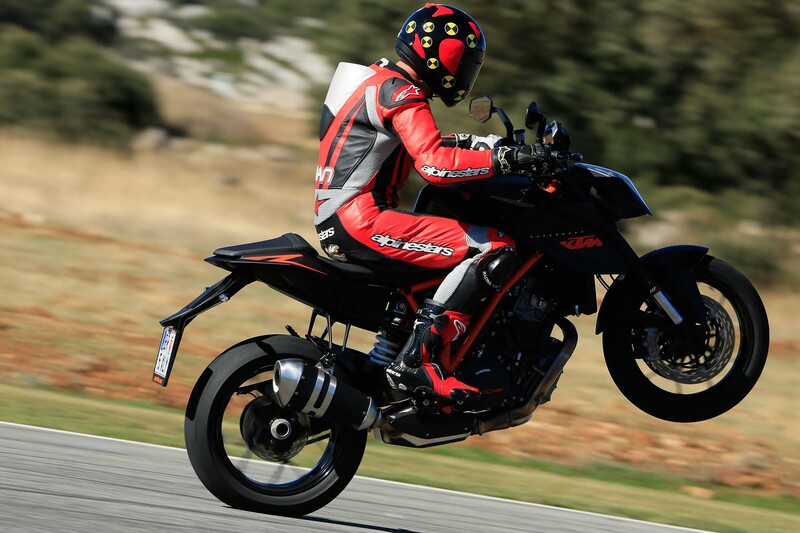 The 1290 Super Duke R only weighs 417 lbs dry. The previous iterations of the LC8-lump were always hampered with a difficult throttle response. 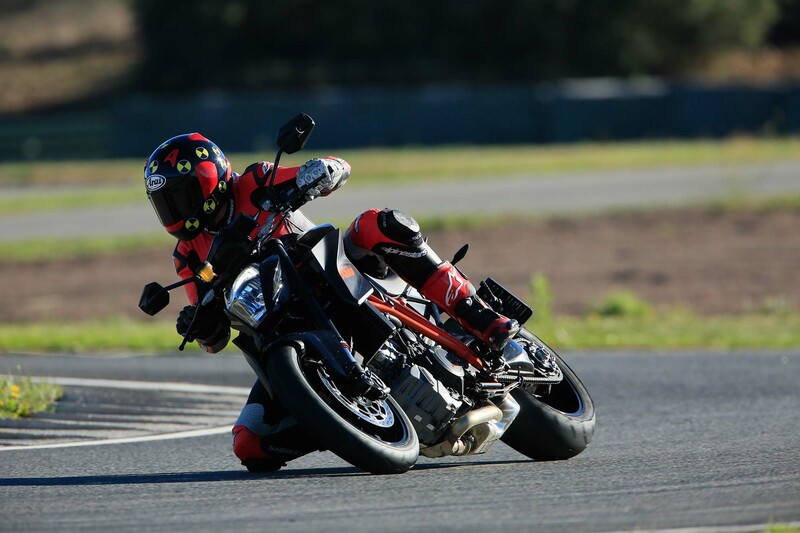 According to KTM, this part-throttle behaviour has been reworked extensively on the KTM 1290 Super Duke R, and we have to agree it does feel fine now, apart from a minimal on-off reaction when you first open the throttle mid-corner. Overall though, we like the driveability of the ride-by-wire system. 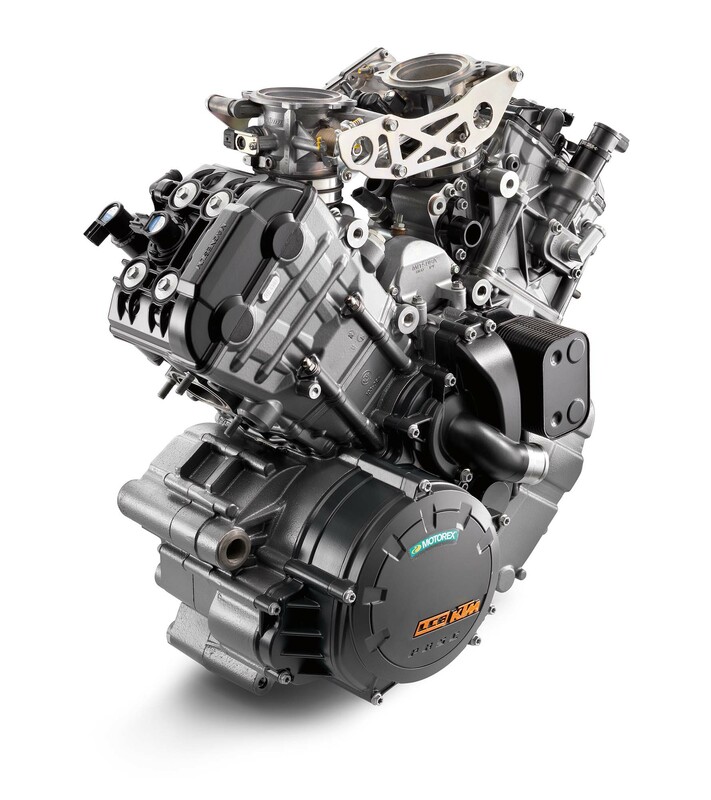 The big v-twin sounds amazing and runs so smoothly that you can use a broad RPM range in any gear, although you do need to stay above 4,000 rpm to avoid bucking. Above that the engine truly is a beast: turn the traction control off and it’s simply impossible to keep the front wheel down in the first 3 gears. In fourth, fifth, or sixth, a tiny crest in the road will result into a power-wheelie. 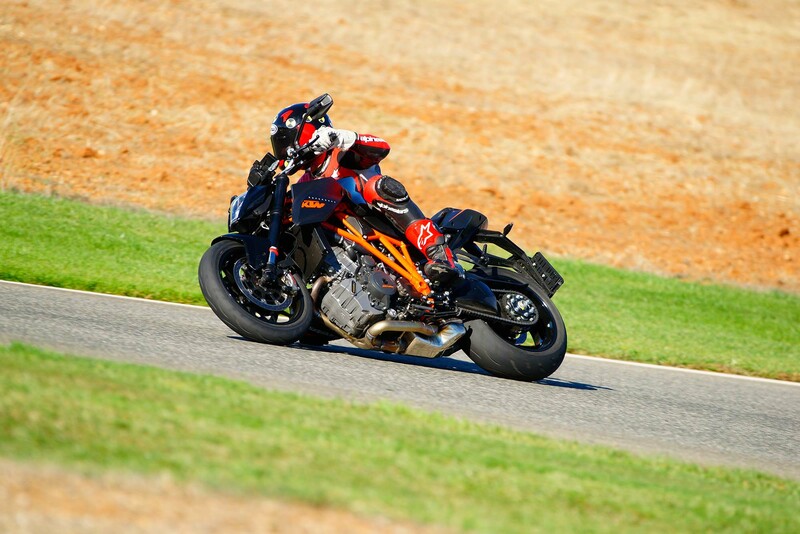 KTM definitely didn’t lie when they christened this bike as ‘The Beast’: the 1290 Super Duke R is faster, stronger, wilder than you can imagine. It is however geared too long. At freeway speeds in 6th, the engine is lugging along as it sits below 4,000 rpm, and doesn’t feel particularly happy about it. You really don’t need more than 4 gears on public roads unless of course you are addicted to prison speeds. Gearing The Beast shorter however doesn’t seem like a valid solution because of the enormous power that’s available. This is where KTM’s state-of-the-art electronics package, a modern Bosch ABS and traction control system, comes into play. 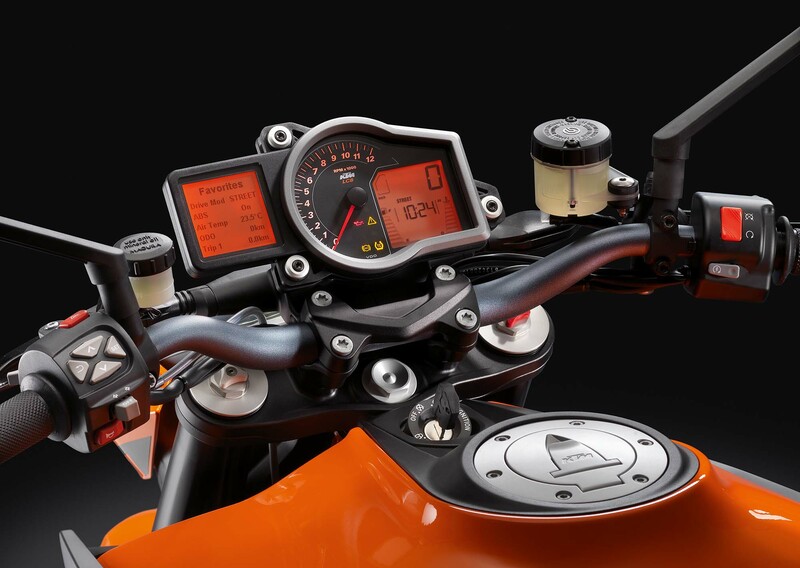 It should be noted that these systems are not the same as the ones on the KTM 1190 Adventure, which means that KTM will not be offering the recently flaunted Bosch MSC stability system on the big Duke. 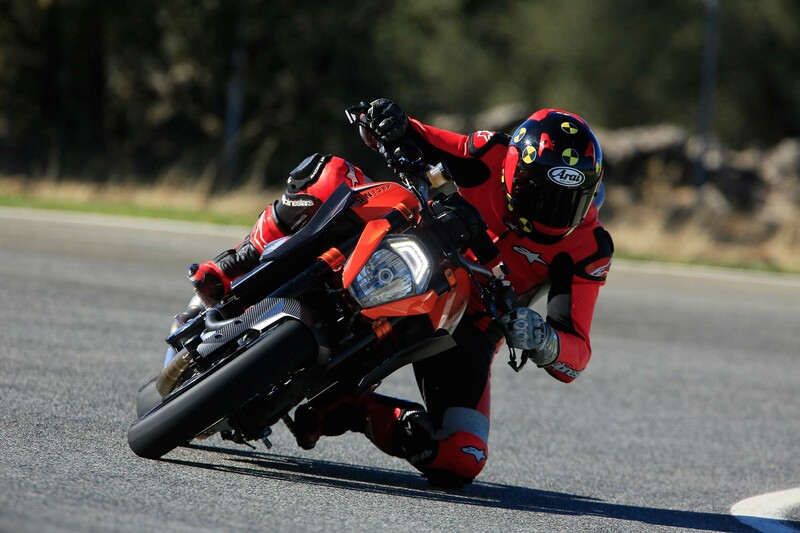 The ABS system is different from most other sport bikes too, in that it works fine on the street, but on track it seems that you can get the most out of the brakes by disabling the ABS altogether. Even in its sports setting, the ABS system comes in too quickly on track. 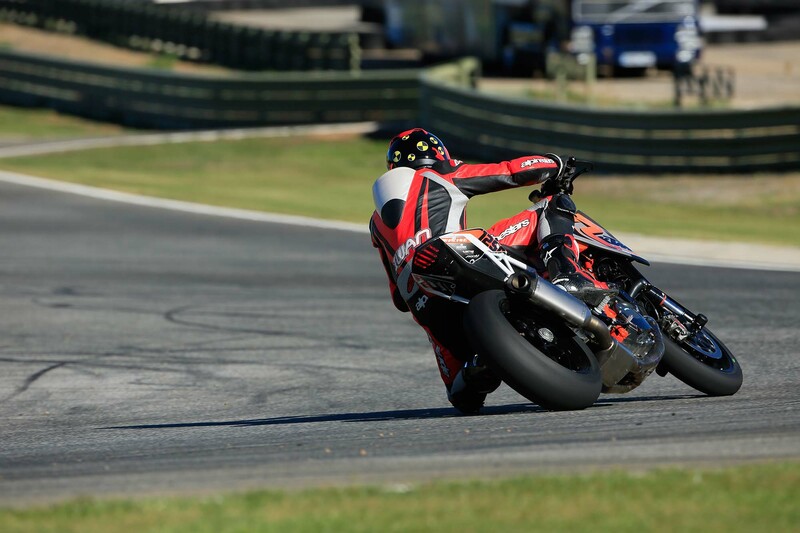 It’s probably more a gimmick than anything else, but experienced riders can also choose a ‘supermoto’ setting for the ABS, which allows you to slide the rear tire. The Bosch Traction Control on the other hand is fantastic. 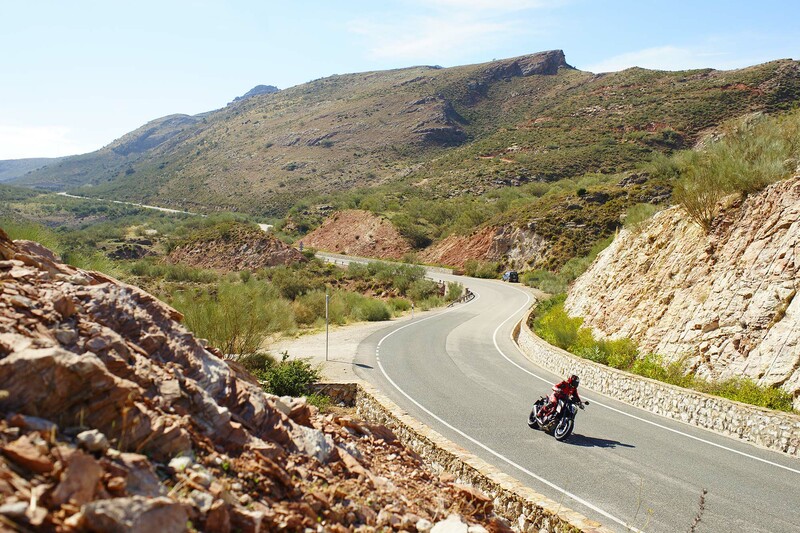 The rough asphalt of the Spanish mountain passes didn’t phase the 180 hp / 106 lbs•ft bike at all as the system worked overtime on the broken surface. At first this felt a bit awkward, but soon you gain full-confidence in the electronics. 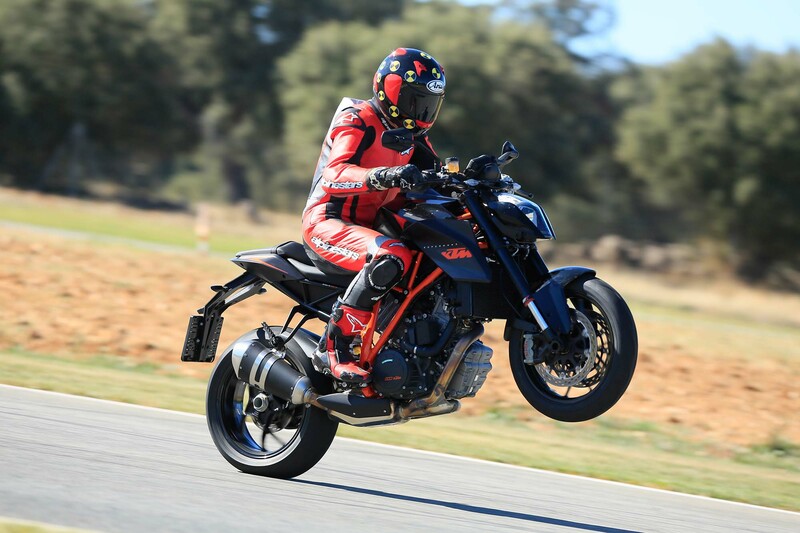 The system worked just as brilliantly on the Ascari track: we could see the TC light coming on in the 90° left-hander, but we couldn’t feel the system working at all, and the Super Duke R stayed perfectly stable. The only downside of this electronics package is the irritating way of turning it off and on. You have to push a button for 5 seconds ,while being stationary, which means that you can’t make any changes on-the-fly and react quickly to changing conditions. 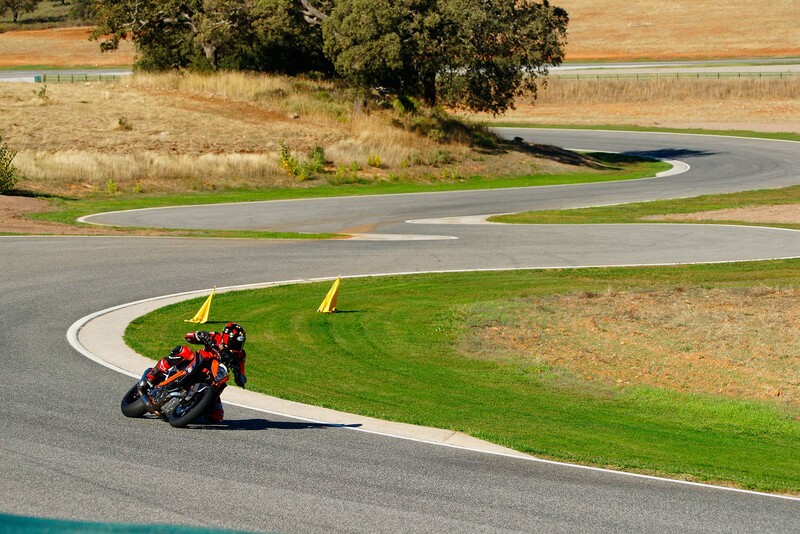 KTM says that they have done this for safety reasons, but this doesn’t seem to add up with their ‘ready to race’ image, and the simple fact of introducing a 180 horsepower bike into the market. 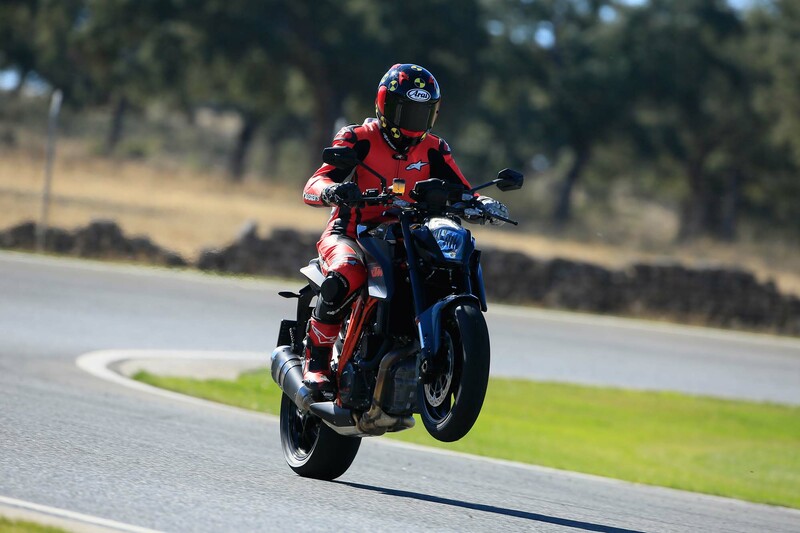 The Brembo M50 monoblocs already proved themselves on other bikes, like the Ducati 1199 Panigale, and they are no different on the 1290 Super Duke. The braking power is immense, but you get so much feedback and feel from the system that you never lose confidence in the front. You can execute emergency stops on loose surfaces without fear of lowsiding. The comfortable seating position really adds to this feeling of total control with a great stock seat and a gentle knee-angle to the pegs . Shifting gears is very easy, although we did get a couple of false neutrals on the rough twisting roads, most probably because of the hectic riding conditions and dodgy roads during the test. The all-new trellis frame is suspended – as always with KTM – by high quality WP elements. The front forks each have separate damping controls, meaning that one leg controls the rebound, while the other one takes care of the compression damping. All in all, there’s more flex in this chassis than you would encounter on a superbike — this is not a hot rod RC8 without fairings. When riding fast, the bike moves around quite a bit and in these extreme conditions it feels nice to have a steering damper as a fail safe. The flexibility does take some getting used to, but you definitely gain confidence after a while. On public roads there’s plenty of ground clearance, but on track our toesliders got a good workout. The race-version we tried had much more ground clearance for this exact reason. The performance of the front end was somewhat hit and miss however. The Dunlop Sportsmart2 tires gave full confidence at one point while lacking grip a little while later. According to KTM no changes were done to the bikes, so we don’t really know why the front-end feedback and grip was so changeable. The rear suspension is of a beautiful single-sided construction, which always feels stable, tight, confident, and perfectly in control thanks to the traction control system. 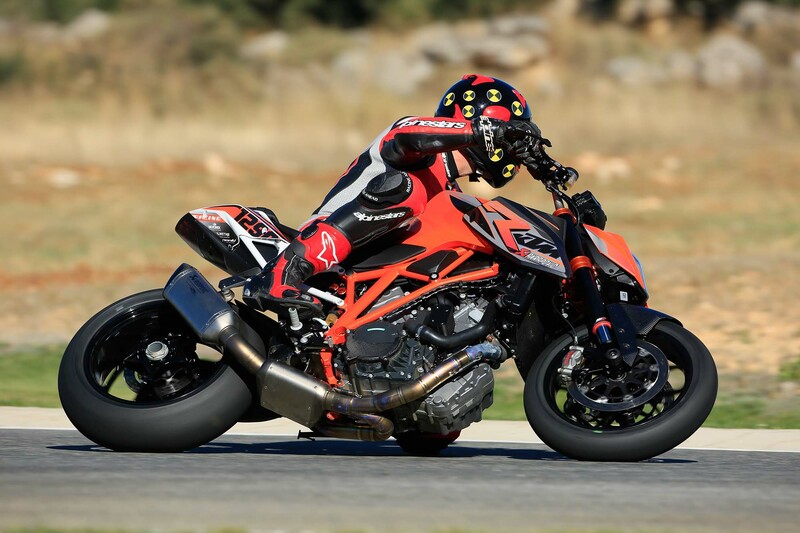 The KTM 1290 Super Duke R is a quality product: the fit and finish looks wonderful except for the contrasting cheap looking exhaust system. Of course KTM likes you to solve this issue by buying a full Akrapovic system…very expensive but then again, it promises an extra 12 horses. The headlight with striking LED daytime running lights is mounted very low on the forks and takes some getting used to visually. It turns on and off automatically and we still feel that the rider should control this but luckily this setup doesn’t flicker as nervously as the Adventure headlight. 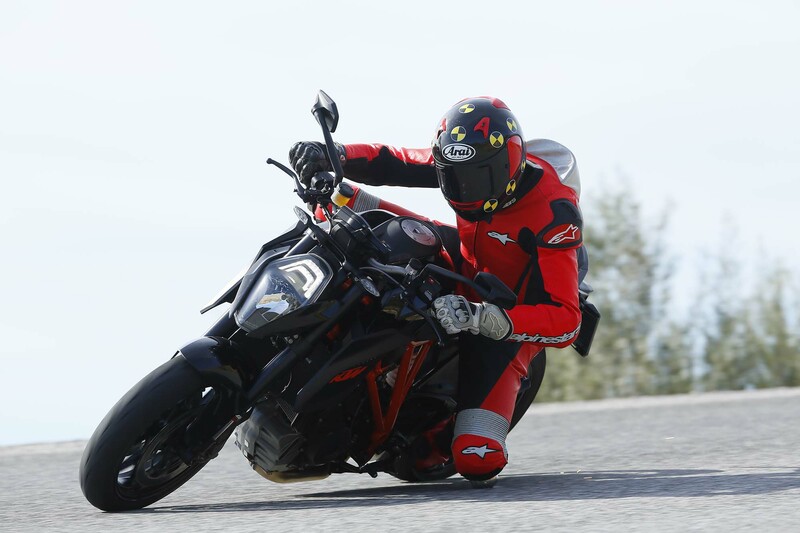 Priced at €17,599 in Europe (not pricing is available in the USA yet), the 2014 KTM 1290 Super Duke R is a hell of a lot of money for a naked bike. For that amount we feel that KTM should have thrown in some carbon bits and a better race-ABS system. 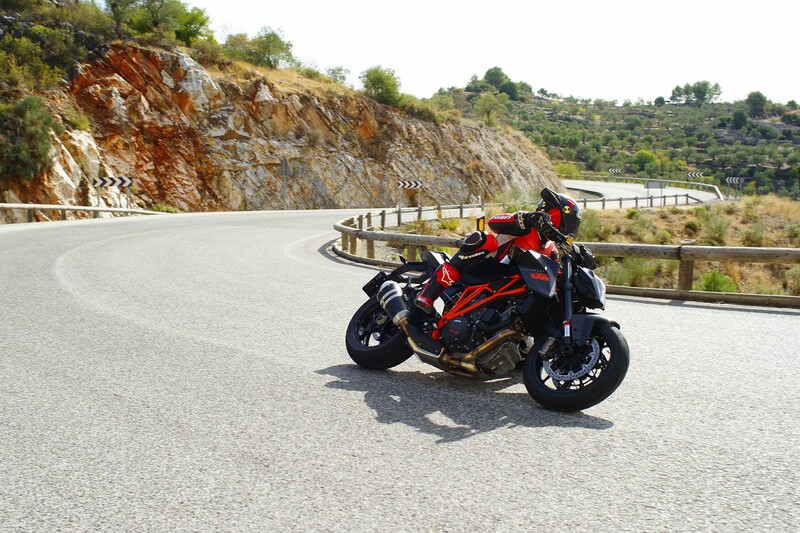 But all-in-all this brand new 1290 Super Duke R doesn’t have any real flaws (apart from the MTC and ABS controls). 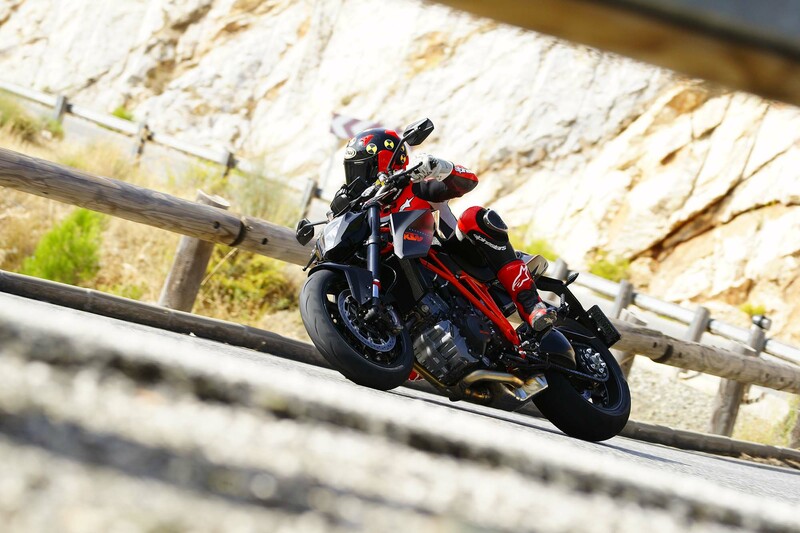 This bike delivers what’s been promised: a insane streetfighter with an obscene amount of power, controlled to be enjoyed to the fullest. 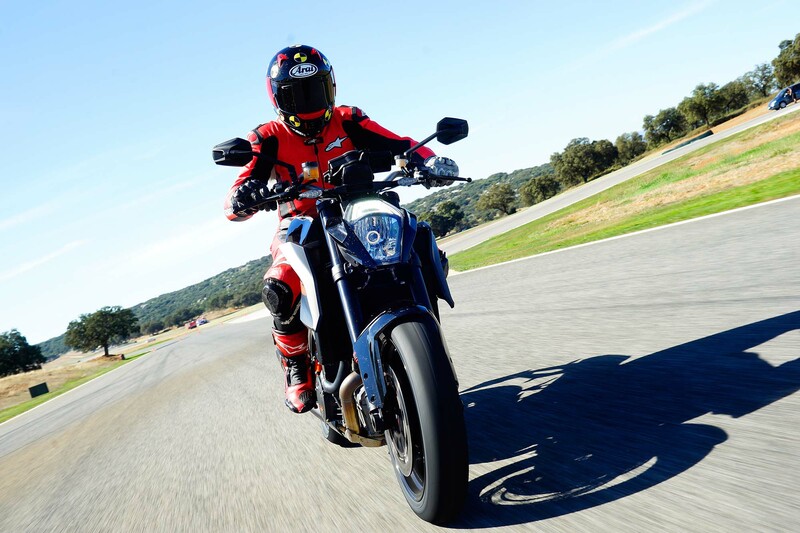 You can ask yourself if all this power is really necessary, but in practice, the huge and addictive wave of torque gives you riding pleasure few bikes can match: powering this beast out of corners feels fantastic, over and over again. It has more power than you’ll ever need or want. The commanding seating position and the wild ride nicely finish off the concept of this big ballsy naked. Just try to keep your licence, if at all possible. A special “dankuwel” to our friends at Testmotor.nl for sharing this article with us, and big thank you as well to Jan DeMan, who translated Iwan’s work from Dutch into English for our readers.